Power BI의 모델링 기능을 사용하면 여러 데이터 원본에 연결한 후 결합하여 요구 사항에 부합하는 고유한 데이터 모델로 만들 수 있습니다.With the modeling capabilities in Power BI, you can connect to multiple data sources, then combine them in ways that create a unique model of data that suits your needs. 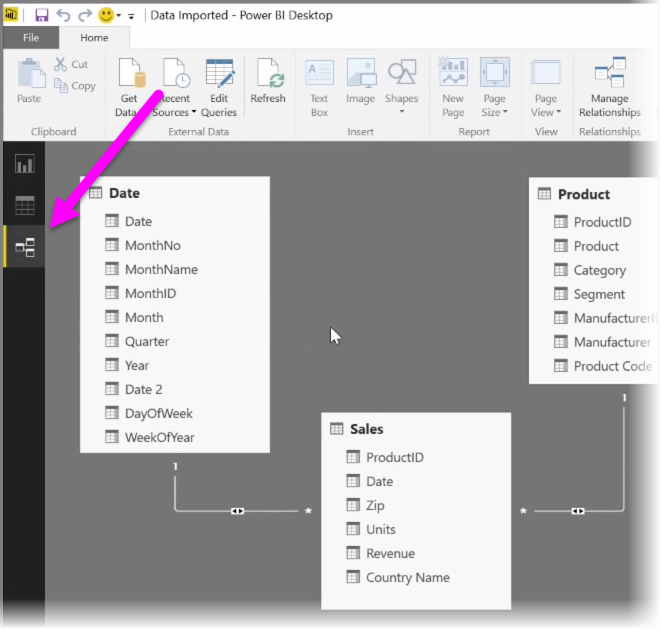 Power BI에 대한 단계별 학습 과정의 모델링 단원을 시작하겠습니다.Welcome to the Modeling section of the Guided Learning course for Power BI. 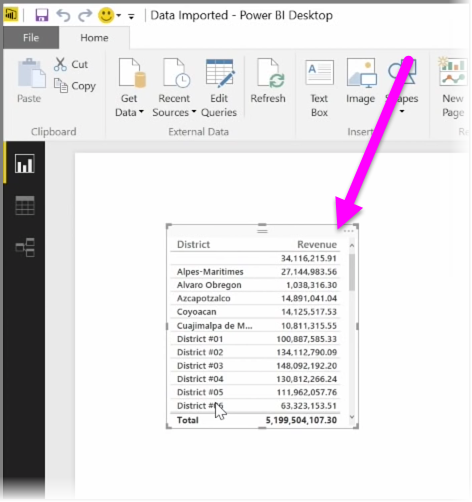 이 단원에서는 Power BI Desktop을 사용하여 연결된 데이터를 사용할 수 있게 준비하는 방법을 보여 줍니다.This section shows you how to get your connected data ready for use, using Power BI Desktop. 둘 이상의 데이터 소스에 연결하여 보고서를 만들고 모든 데이터가 함께 작동하도록 해야 하는 경우가 종종 있습니다.Often, you'll connect to more than one data source to create your reports, and you'll need all of that data to work together. 모델링을 통해 그렇게 할 수 있습니다.Modeling is how you get it there. 서로 다른 데이터 소스 간의 논리적 연결을 만들려면 관계를 만듭니다.To create a logical connection between different data sources, you create a relationship. 데이터 소스 간의 관계를 통해 Power BI에서는 흥미로운 시각적 개체 및 보고서를 만들 수 있도록 이러한 테이블 간의 상호 관계를 인식합니다.A relationship between data sources enables Power BI to know how those tables relate to one another, allowing you to create interesting visuals and reports. 이 단원에서는 관계(데이터 중심적 관계만)를 설명하며, 아무 관계도 존재하지 않을 때 관계를 만드는 방법을 보여 줍니다.This section explains relationships (only the data-centric ones, though), and even shows you how to create relationships when none exists. 이 과정에서는 항상 Power BI의 작업 흐름과 동일한 경로를 따라 학습이 진행됩니다.As always in this course, your learning journey follows the same path as the flow of work in Power BI. 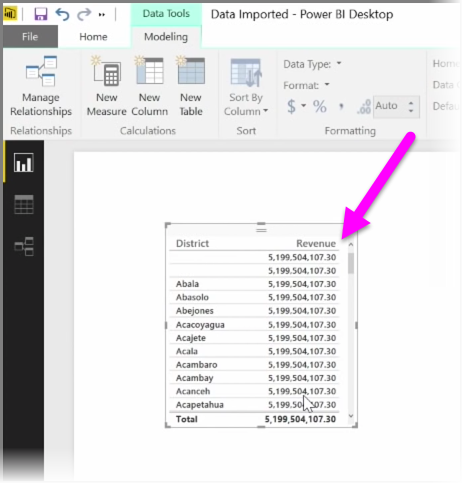 이 단원에서는 대부분 Power BI Desktop에 있게 되지만 여기서 완료된 작업은 Power BI 서비스에서 작업할 때 직접적인 영향을 줍니다.We'll still be in Power BI Desktop for most of this section, but the work done here has direct affect on working in the Power BI service. 데이터를 가져와 변환하는 방법을 검토했으므로 이제 모델링을 시작해야 합니다.Now that we've reviewed how to import your data and transform it, it's time to start modeling. Power BI의 장점 중 하나는 데이터를 하나의 테이블로 평면화할 필요가 없다는 점입니다.One of Power BI's strengths is that you don't need to flatten your data into one table. 대신 여러 소스의 여러 테이블을 사용하고 그 사이의 관계를 정의할 수 있습니다.Instead, you can use multiple tables from multiple sources, and define the relationship between them. 또한 사용자 고유의 사용자 지정 계산을 만들고 새 메트릭을 할당하여 데이터의 특정 세그먼트를 볼 수 있으며, 손쉬운 모델링을 위해 시각화에서 이러한 새 측정값을 사용할 수 있습니다.You can also create your own custom calculations and assign new metrics to view specific segments of your data, and use these new measures in visualizations for easy modeling. 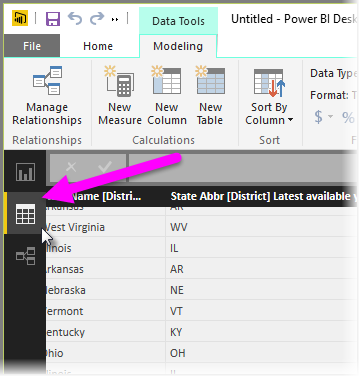 Power BI에서는 테이블 또는 요소 간의 관계를 시각적으로 설정할 수 있습니다.Power BI allows you to visually set the relationship between tables or elements. 데이터의 다이어그램 뷰를 보려면 보고서 캔버스 옆 화면의 맨 왼쪽에 있는 관계 뷰를 사용합니다.To see a diagrammatic view of your data, use the Relationship view, found on the far left side of the screen next to the Report canvas. 관계 뷰에서는 각 테이블과 해당 열을 나타내는 블록 및 그 사이의 관계를 나타내는 선을 볼 수 있습니다.From the Relationships view, you can see a block that represents each table and its columns, and lines between them to represent relationships. 관계를 추가하고 제거하는 작업은 간단합니다.Adding and removing relationships is simple. 관계를 제거하려면 해당 관계를 마우스 오른쪽 단추로 클릭하고 삭제를 선택합니다.To remove a relationship, right-click on it and select Delete. 관계를 만들려면 테이블 간에 연결할 필드를 끌어서 놓습니다.To create a relationship, drag and drop the fields that you want to link between tables. 테이블 또는 개별 열을 보고서에서 숨기려면 관계 뷰에서 해당 테이블 또는 열을 마우스 오른쪽 단추로 클릭하고 보고서 뷰에서 숨기기를 선택합니다.To hide a table or individual column from your report, right-click on it in the Relationship view and select Hide in Report View. 데이터 관계의 보다 자세한 뷰를 보려면 홈 탭의 관계 관리를 선택합니다. 그러면 시각적 다이어그램 대신 목록으로 관계를 표시하는 관계 관리 대화 상자가 열립니다.For a more detailed view of your data relationships, select Manage Relationships in the Home tab. 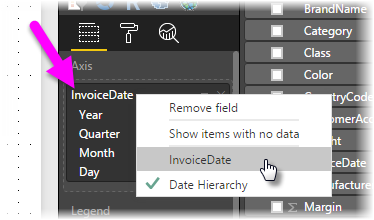 This will open the Manage Relationships dialog, which displays your relationships as a list instead of a visual diagram. 여기에서 자동 검색을 선택하여 새 데이터 또는 업데이트된 데이터에서 관계를 찾을 수 있습니다.From here you can select Autodetect to find relationships in new or updated data. 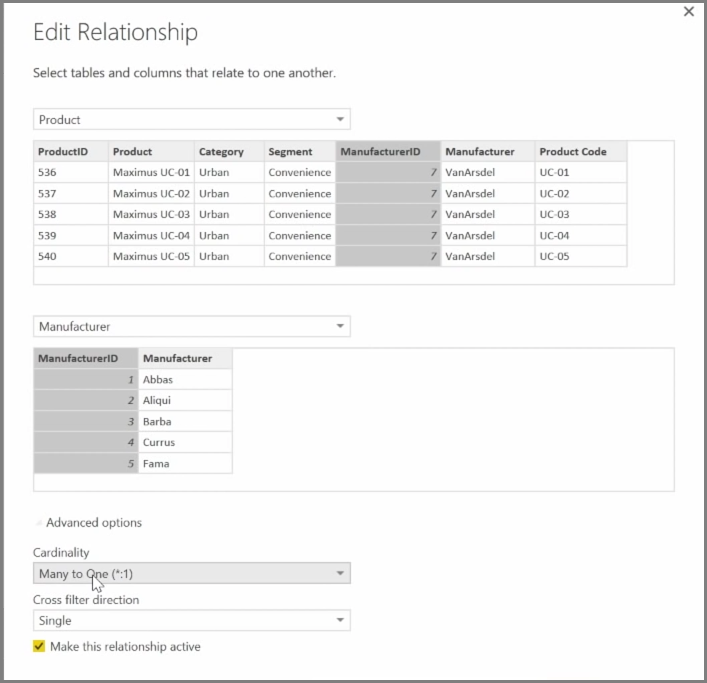 관계를 수동으로 편집하려면 관계 관리 대화 상자에서 편집을 선택합니다.Select Edit in the Manage Relationships dialog to manually edit your relationships. 여기에는 관계의 카디널리티 및 교차 필터 방향을 설정할 수 있는 고급 옵션도 있습니다.This is also where you can find advanced options to set the Cardinality and Cross-filter direction of your relationships. 카디널리티 옵션은 다 대 일 및 일 대 일입니다.Your options for Cardinality are Many to One, and One to One. 다 대 일은 팩트 대 차원 형식 관계입니다. 예를 들어 제품당 여러 행이 있는 판매량 테이블이 고유한 행에 제품을 나열하는 테이블과 일치됩니다.Many to One is the fact to dimension type relationship, for example a sales table with multiple rows per product being matched up with a table listing products in their own unique row. 일 대 일은 참조 테이블에서 단일 항목을 연결하는 데 자주 사용됩니다.One to One is used often for linking single entries in reference tables. 기본적으로 관계는 양방향 교차 필터로 설정됩니다.By default, relationships will be set to cross-filter in both directions. 단방향 교차 필터는 관계에서 일부 모델링 기능을 제한합니다.Cross-filtering in just one direction limited some of the modeling capabilities in a relationship. 데이터 간의 정확한 관계를 설정하면 여러 데이터 요소에서 복잡한 계산을 만들 수 있습니다.Setting accurate relationships between your data allows you to create complex calculations across multiple data elements. 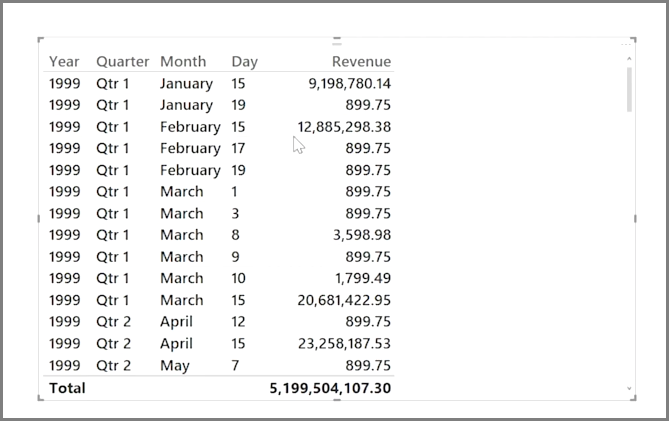 계산 열을 만들면 데이터를 간단하게 보강하고 개선할 수 있습니다.Creating calculated columns is a simple way to enrich and enhance your data. 계산 열은 둘 이상의 기존 데이터 요소를 변환하거나 결합하는 계산을 정의하여 만드는 새 열입니다.A calculated column is a new column that you create by defining a calculation that transforms or combines two or more elements of existing data. 예를 들어 두 개의 열을 하나로 결합하여 새 열을 만들 수 있습니다.For example, you can create a new column by combining two columns into one. 계산 열을 만드는 한 가지 이유는 관계를 설정하는 데 사용할 수 있는 고유 필드가 없을 때 테이블 간의 관계를 설정하기 위한 것입니다.One useful reason for creating a calculated column is to establish a relationship between tables, when no unique fields exist that can be used to establish a relationship. 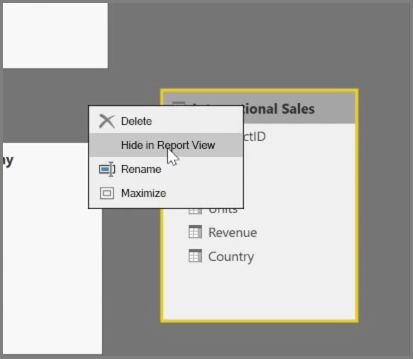 관계의 부재는 Power BI Desktop에서 간단한 테이블 시각적 개체를 만들 때 기본 데이터가 다르다는 것을 알면서도 모든 항목에 대해 동일한 값을 가져오는 경우에 명확히 드러납니다.The lack of a relationship becomes apparent when you create a simple table visual in Power BI Desktop, and you get the same value for all entries, yet you know the underlying data is different. 데이터에서 고유 필드 간의 관계를 만들려면 예를 들어 해당 값이 데이터에 존재하는 경우 "지역 번호" 및 "전화 번호" 열의 값을 결합하여 "전체 전화 번호"에 대한 새 계산 열을 만들 수 있습니다.To create a relationship with unique fields in data, you can, for example, create a new calculated column for "Full Phone Number" by combining the values from the "Area Code" and "Local Number" columns when those values exist in your data. 계산 열은 모델 및 시각화를 신속하게 만드는 데 유용한 도구입니다.Calculated columns are a useful tool for quickly creating models and visualizations. 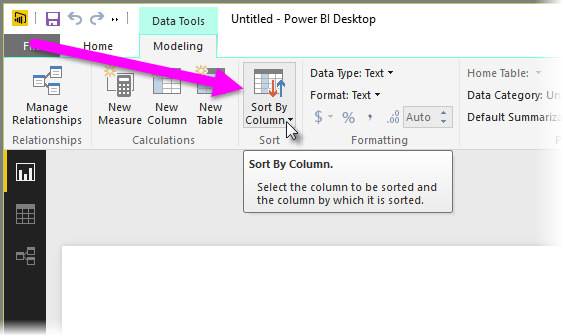 계산 열을 만들려면 Power BI Desktop의 보고서 캔버스 왼쪽에서 데이터 뷰를 선택합니다.To create a calculated column, select the Data view in Power BI Desktop from the left side of the report canvas. 모델링 탭에서 새 열을 선택합니다.From the Modeling tab, select New Column. 그러면 DAX(데이터 분석 식) 언어를 사용하여 계산을 입력할 수 있는 수식 입력줄이 활성화됩니다.This will enable the formula bar where you can enter calculations using DAX (Data Analysis Expressions) language. DAX는 견고한 계산을 작성할 수 있는 강력한 수식 언어로서, Excel에도 있습니다.DAX is a powerful formula language, also found in Excel, that lets you build robust calculations. 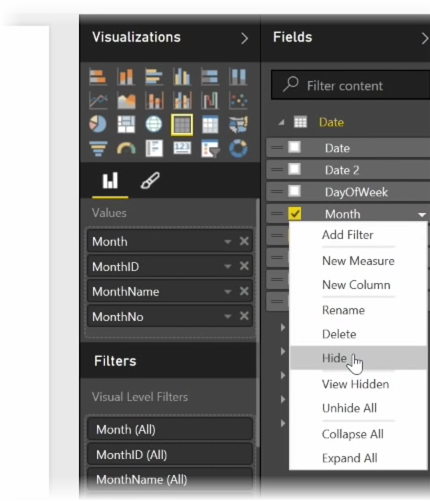 수식을 입력하면 Power BI Desktop에서 수식 만들기를 지원하고 가속화하기 위해 일치하는 수식 또는 데이터 요소를 표시합니다.As you type a formula, Power BI Desktop displays matching formulas or data elements to assist and accelerate the creation of your formula. 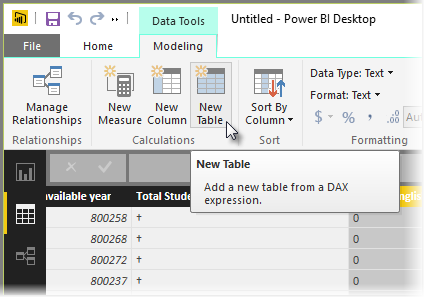 식을 입력할 때 Power BI 수식 입력줄에 특정 DAX 함수 및 관련 데이터 열이 제안됩니다.The Power BI formula bar will suggest specific DAX functions and related data columns as you enter your expression. 각 테이블에 계산 열이 만들어지면 이 열을 고유 키로 사용하여 열 간의 관계를 설정할 수 있습니다.Once the calculated columns are created in each table, they can be used as a unique key to establish a relationship between them. 그런 다음 관계 뷰로 이동하여 테이블 간에 필드를 끌어서 관계를 만들 수 있습니다.Going to Relationship view, you can then drag the field from one table to the other to create the relationship. 이제 보고서 뷰로 돌아가면 각 지역에 대해 서로 다른 값이 표시됩니다.Returning to Report view, you now see a different value for each district. 계산 열을 만들어 수행할 수 있는 다른 모든 종류의 작업도 있습니다.There are all sorts of other things you can do by creating calculated columns, too. 가져온 데이터에는 추가 정보이거나 해당 데이터를 다른 열에서 이미 사용할 수 있기 때문에 보고 및 시각화 작업에 실제로 필요하지 않은 필드가 포함되어 있는 경우가 종종 있습니다.Imported data often contains fields that you don't actually need for your reporting and visualization tasks, either because it's extra information, or because that data is already available in another column. 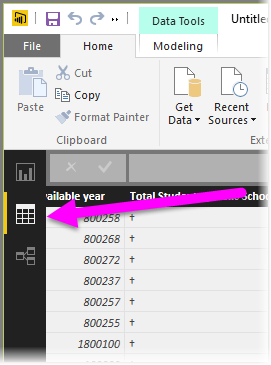 Power BI Desktop에는 데이터를 최적화하여 보고서 및 시각적 개체를 만들고 공유된 보고서를 보는 데 보다 유용하게 해주는 도구가 있습니다.Power BI Desktop has tools to optimize your data, and make it more usable for you to create reports and visuals, and for viewing your shared reports. 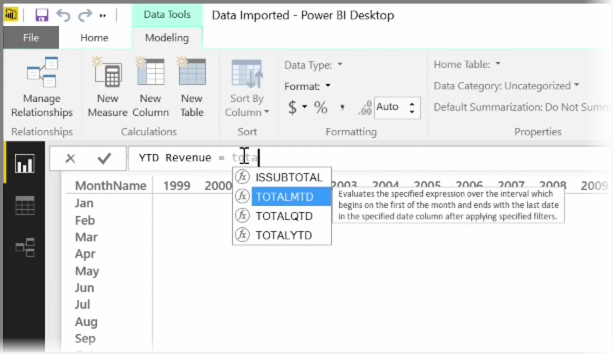 Power BI Desktop의 필드 창에서 열을 숨기려면 해당 열을 마우스 오른쪽 단추로 클릭하고 숨기기를 선택합니다.To hide a column in the Fields pane of Power BI Desktop, right-click on it and select Hide. 숨겨진 열은 삭제되지 않습니다. 기존 시각화 요소에서 해당 필드를 사용한 경우 해당 시각적 개체에 데이터가 여전히 존재하며, 이 데이터를 다른 시각화 요소에서 계속 사용할 수 있습니다. 숨겨진 필드는 필드 창에 표시되지 않을 뿐입니다.Note that your hidden columns are not deleted; if you've used that field in existing visualizations, the data is still in that visual, and you can still use that data in other visualizations too, the hidden field just isn't displayed in the Fields pane. 관계 뷰에서 테이블을 보는 경우 숨겨진 필드는 회색으로 표시됩니다. 해당 데이터는 여전히 사용할 수 있고 모델의 일부분이며 뷰에서 숨겨질 뿐입니다.If you view tables in the Relationships view, hidden fields are indicated by being grayed out. Again, their data is still available and is still part of the model, they're just hidden from view. 언제든지 필드를 마우스 오른쪽 단추로 클릭하고 숨기기 취소를 선택하여 숨겨진 필드의 숨기기를 취소할 수 있습니다.You can always unhide any field that has been hidden by right-clicking the field, and selecting unhide. 모델링 탭에서 제공되는 열 기준 정렬 도구는 데이터를 의도한 순서대로 표시하는 데 매우 유용합니다.The Sort by Column tool, available in the Modeling tab, is very useful to ensure that your data is displayed in the order you intended. 일반적인 예로, 월 이름이 포함된 데이터는 기본적으로 사전순으로 정렬되므로 "August"가 "February" 앞에 표시됩니다.As a common example, data that includes the name of the month is sorted alphabetically by default, so for example, "August" appears before "February". 이 경우 필드 목록에서 필드를 선택하고 모델링 탭에서 열 기준 정렬을 선택한 다음 정렬할 필드를 선택하면 문제를 해결할 수 있습니다.In this case, selecting the field in the Fields list, then selecting Sort By Column from the Modeling tab and then choosing a field to sort by can remedy the problem. 이 경우 "MonthNo" 범주 정렬 옵션은 월을 의도한 대로 정렬합니다.In this case, the "MonthNo" category sort option orders the months as intended. 필드의 데이터 형식을 설정하는 것은 정보를 올바르게 처리되도록 최적화하는 또 다른 방법입니다.Setting the data type for a field is another way to optimize your information so it's handled correctly. 보고서 캔버스에서 데이터 형식을 변경하려면 필드 창에서 열을 선택한 다음 서식 드롭다운 메뉴를 사용하여 서식 지정 옵션 중 하나를 선택합니다.To change a data type from the report canvas, select the column in the Fields pane, and then use the Format drop-down menu to select one of the formatting options. 사용자가 만든 시각적 개체 중 해당 필드를 표시하는 모든 시각적 개체가 자동으로 업데이트됩니다.Any visuals you've created that display that field are updated automatically. 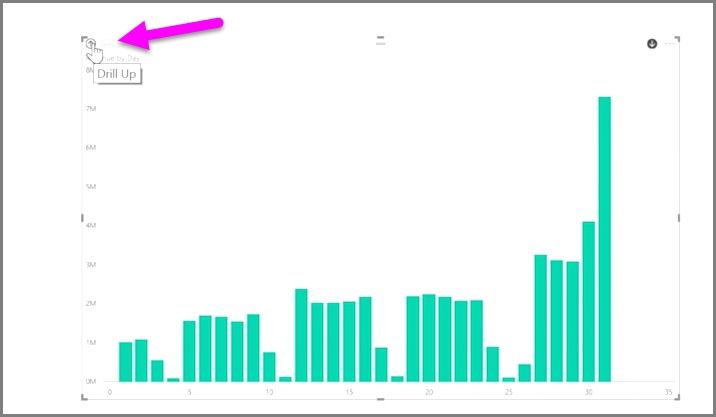 측정값은 Power BI 데이터 모델에 존재하는 계산입니다.A measure is a calculation that exists in your Power BI data model. 측정값을 만들려면 보고서 뷰의 모델링 탭에서 새 측정값을 선택합니다.To create a measure, in Report view select New Measure from the Modeling tab. Power BI의 데이터 분석 식 언어인 DAX의 장점 중 하나는 특히 연간 누계 또는 전년동기대비와 같은 시간 기반 계산과 관련하여 유용한 함수가 많다는 점입니다.One of the great things about DAX, the Data Analysis Expression language in Power BI, is that it has lots of useful functions, particularly around time-based calculations such as Year to Date or Year Over Year. DAX를 사용하면 시간 측정값을 한 번 정의한 다음 데이터 모델에서 원하는 개수의 필드로 조각화할 수 있습니다.With DAX you can define a measure of time once, and then slice it by as many different fields as you want from your data model. 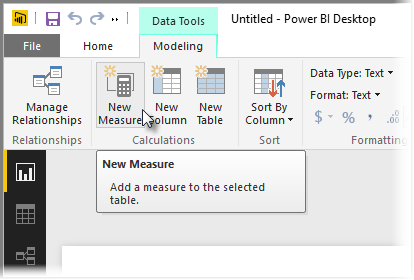 Power BI에서는 정의된 계산을 측정값이라고 합니다.In Power BI, a defined calculation is called a measure. 측정값을 만들려면 홈 탭에서 새 측정값을 선택합니다. 그러면 측정값을 정의하는 DAX 식을 입력할 수 있는 수식 입력줄이 열립니다.To create a measure, select New Measure from the Home tab. This opens the Formula bar where you can enter the DAX expression that defines your measure. 계산을 입력할 때 Power BI에서 관련 DAX 함수 및 데이터 필드를 제안하며, 일부 구문 및 함수 매개 변수를 설명하는 도구 설명도 확인할 수 있습니다.As you type, Power BI suggests relevant DAX functions and data fields as you enter your calculation, and you'll also get a tooltip explaining some of the syntax and function parameters. 계산이 매우 긴 경우 식 편집기에서 ALT-Enter를 입력하여 줄 바꿈을 더 추가할 수 있습니다.If your calculation is particularly long, you can add extra line breaks in the Expression Editor by typing ALT-Enter. 새 측정값을 만들면 화면 오른쪽에 있는 필드 창의 테이블 중 하나에 해당 측정값이 표시됩니다.Once you've created a new measure, it will appear in one of the tables on the Fields pane, found on the right side of the screen. Power BI에서는 새 측정값을 현재 선택한 테이블에 삽입합니다. 데이터에서 측정값이 있는 정확한 위치는 중요하지 않지만 측정값을 선택하고 홈 테이블 드롭다운 메뉴를 사용하여 쉽게 이동할 수 있습니다.Power BI inserts the new measure into whichever table you have currently selected, and while it doesn't matter exactly where the measure is in your data, you can easily move it by selecting the measure and using the Home Table drop-down menu. 다른 모든 테이블 열과 마찬가지로 측정값을 사용할 수 있습니다. 보고서 캔버스 또는 시각화 필드에 끌어 놓기만 하면 됩니다.You can use a measure like any other table column: just drag and drop it onto the report canvas or visualization fields. 또한 측정값은 슬라이서와 원활하게 통합되어 데이터를 즉석에서 분할합니다. 따라서 측정값을 한 번 정의한 후 여러 시각화 요소에서 이를 사용할 수 있습니다.Measures also integrate seamlessly with slicers, segmenting your data on the fly, which means you can define a measure once, and use it in many different visualizations. Calculate DAX 함수는 유용한 모든 종류의 계산을 지원하는 강력한 함수로서, 재무 보고 및 시각적 개체에 특히 유용합니다.The Calculate DAX function is a powerful function that enables all sorts of useful calculations, which is especially useful for financial reporting and visuals. 계산 테이블은 전체 범위의 새 모델링 기능을 표현할 수 있는 DAX 내의 함수입니다.Calculated tables are a function within DAX that allows you to express a whole range of new modeling capabilities. 예를 들어 여러 유형의 병합 조인을 수행하거나 함수 수식의 결과에 따라 즉석에서 새 테이블을 만들려는 경우 계산 테이블을 사용하여 이를 수행할 수 있습니다.For example, if you want to do different types of merge joins or create new tables on the fly based on the results of a functional formula, calculated tables are the way to accomplish that. 계산 테이블을 만들려면 보고서 캔버스의 왼쪽에서 활성화할 수 있는 Power BI Desktop에서 데이터 뷰로 이동합니다.To create a calculated table, go to Data view in Power BI Desktop, which you can activate from the left side of the report canvas. 모델링 탭에서 새 테이블을 선택하여 수식 입력줄을 엽니다.Select New Table from the Modeling tab to open the formula bar. 등호 기호 왼쪽에 새 테이블의 이름을 입력하고 오른쪽에 해당 테이블을 구성하는 데 사용할 계산을 입력합니다.Type the name of your new table on the left side of the equal sign, and the calculation that you want to use to form that table on the right. 계산을 완료하면 모델의 필드 창에 새 테이블이 표시됩니다.When you're finished your calculation, the new table appears in the Fields pane in your model. 계산 테이블을 만든 후에는 관계, 수식 및 보고서의 다른 모든 테이블과 동일한 방식으로 사용할 수 있습니다.Once created, you can use your calculated table as you would any other table in relationships, formulas, and reports. 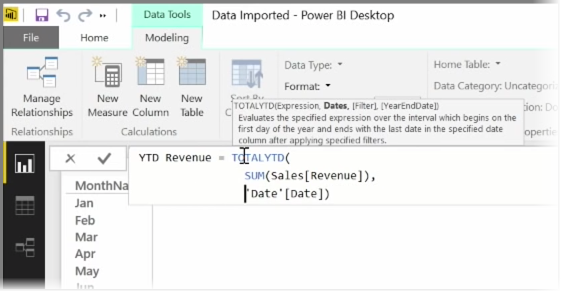 Power BI를 사용하여 시간 기반 데이터를 쉽게 분석할 수 있습니다.It's easy to analyze time-based data with Power BI. 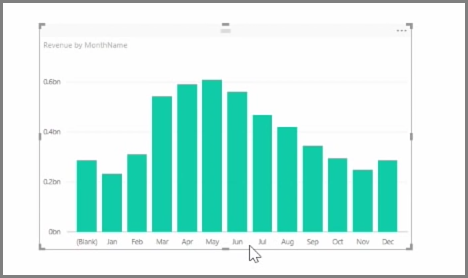 Power BI Desktop의 모델링 도구는 년, 분기, 월 및 일을 한 번의 클릭으로 드릴다운할 수 있는 생성된 필드를 자동으로 포함합니다.The modeling tools in Power BI Desktop automatically include generated fields that let you drill down through years, quarters, months, and days with a single click. 날짜 필드를 사용하여 보고서에서 테이블 시각화 요소를 만든 경우 Power BI Desktop은 기간별 분석 결과를 자동으로 포함합니다.When you create a table visualization in your report using a date field, Power BI Desktop automatically includes breakdowns by time period. 예를 들어 다음 그림과 같이 날짜 테이블의 단일 날짜 필드가 Power BI에서 년, 분기, 월 및 일로 자동으로 구분됩니다.For example, the single date field in the Date table was automatically separated into Year, Quarter, Month and Day by Power BI, as shown in the following image. 시각화는 기본적으로 데이터를 년 수준에서 표시하지만 시각적 개체 오른쪽 위에 있는 드릴다운을 설정하여 이를 변경할 수 있습니다.Visualizations display data at the year level by default, but you can change that by turning on Drill Down in the top right-hand corner of the visual. 이제 차트에서 막대 또는 선을 클릭하면 시간 계층의 다음 수준으로 드릴다운됩니다(예: 년에서 분기로).Now when you click on the bars or lines in your chart, it drills down to the next level of time hierarchy, for example from years to quarters. 계층의 가장 세분화된 수준(이 예제의 경우 일)에 도달할 때까지 계속 드릴다운할 수 있습니다.You can continue to drill down until you reach the most granular level of the hierarchy, which in this example is days. 다시 시간 계층 위로 이동하려면 시각적 개체 왼쪽 위에 있는 드릴업을 클릭합니다.To move back up through the time hierarchy, click on Drill Up in the top left-hand corner of the visual. 시각적 개체 오른쪽 위에 있는 모두 드릴 양방향 화살표를 사용하여 선택된 하나의 기간 대신 시각적 개체에 표시된 모든 데이터를 드릴다운할 수도 있습니다.You can also drill down through all of the data shown on the visual, rather than one selected period, by using the Drill All double-arrow icon, also in the top right-hand corner of the visual. 모델에 날짜 필드가 있는 경우 Power BI는 여러 시간 계층에 대한 서로 다른 뷰를 자동으로 생성합니다.As long as your model has a date field, Power BI will automatically generate different views for different time hierarchies. 날짜 계층 구조를 사용하지 않고 개별 날짜로 돌아오려면 필드에서 열 이름을 마우스 오른쪽 단추로 클릭한 다음(다음 그림에서는 열 이름이 InvoiceDate), 날짜 계층 구조가 아니라 표시되는 메뉴에서 열 이름을 선택합니다.To get back to individual dates rather than using the date hierarchy, simply right-click the column name in the Fields well (in the following image, the name of the column is InvoiceDate), then select the column name from the menu that appears, rather than Date Hierarchy. 그러면 시각화는 날짜 계층을 사용하지 않고 열 데이터에 근거한 데이터를 표시합니다.Your visual then shows the data based on that column data, without using the date hierarchy. 날짜 계층 구조를 사용하여 다시 돌아가야 합니까?Need to go back to using the date hierarchy? 아닙니다 - 다시 마우스 오른쪽 단추로 클릭하고 메뉴에서 날짜 계층 구조를 선택하기만 하면 됩니다.No problem - just right-click again and select Date Hierarchy from the menu. 축하합니다!Congratulations! 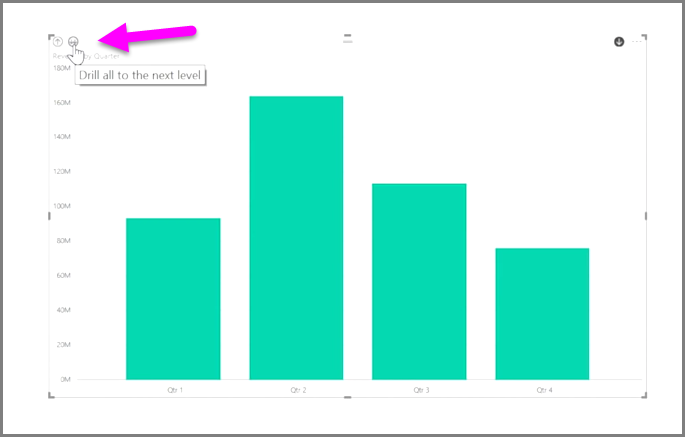 Power BI에 대한 단계별 학습 과정의 이 단원을 완료하셨습니다.You've completed this section of the Guided Learning course for Power BI. 이제 데이터 모델링에 대해 알았으므로 다음 단원인 시각화에서 흥미로운 내용을 학습할 준비가 되었습니다.Now that you know about modeling data, you're ready to learn about the fun stuff waiting in the next section: Visualizations. 이 모든 작업을 직접 수행하지 않을 수도 있지만 대시보드를 만드는 방법 및 대시보드를 데이터에 연결하는 방법을 이해할 수 있으며, 이 과정을 완료한 경우 자신만의 대시보드를 만들 수도 있을 것입니다.While you might not do all that work yourself, you'll understand how those dashboards were created, and how they connected to the data... and when you're done with this course, you'll be able to create one of your own. 잘하고 계십니다.You are on a roll. 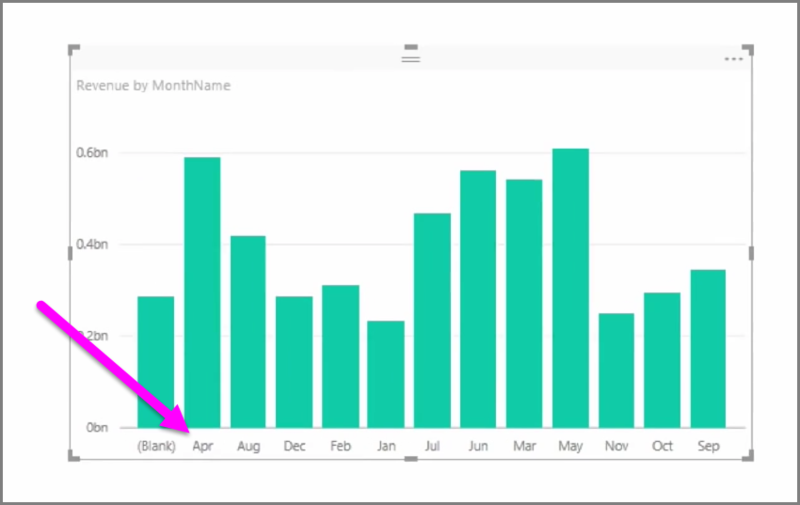 멈추지 말고 계속 Power BI에 대해 알아보세요!Keep up the good work in learning about Power BI! 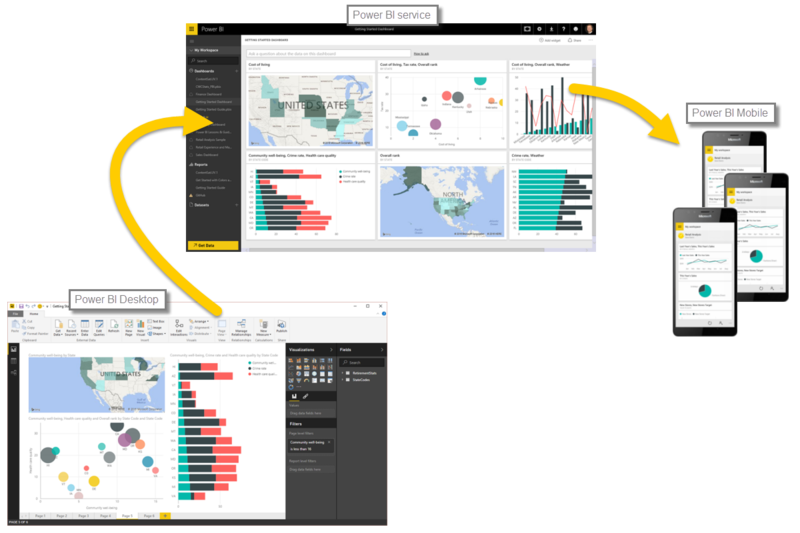 Power BI에 대한 단계별 학습 과정의 모델링 단원을 마쳤습니다.You've completed the Modeling section of Microsoft Power BI Guided learning. 다음은 시각화입니다.Next up is visualizations.